The last weekend of July 2014 was another epic journey for our trusty runaround, the Nemethmobile. The car has now clocked up so many miles that the digital odometer has suffered the distance-equivalent of the Millennium Bug, rolling around to zero after it hit 299,999 miles, much to Dad’s surprise and amusement. After a lovely National Youth Choir of Wales concert in Wrexham, North Wales, we pointed the car towards Gloucestershire. Mum had identified the Almondsbury Interchange Hotel & Restaurant, which offered us a very reasonably priced family room. My first port of call is usually Travelodge, but the availability that weekend was (unusually) very poor: in fact, there were no family rooms at all in the nearest ten hotels to Gloucester (possibly, as we’d later find out, due to the WOMAD festival). Whilst we often use Travelodge, it’s good to be forced off our ‘default setting’ once in a while. A friendly phone booking left a good impression, and we were informed that the reception was open 24 hours: this was important to us as we knew we’d be arriving in the early morning. The room was spacious, incredibly clean, and the beds very comfortable. The shower was straightforward and all the better for it; showers with temperature controls purport to be better, but they can be tough to turn especially when wet, and it normally takes me a good few minutes to get a comfortable temperature out of them. Call me old before my time, but a hot and cold tap is far more preferable, not to mention the option of a full bath. Little things, too: there were enough seats for people in the room (something which you tend not to take for granted as travellers on a budget), and even a bedside cabinet and lamp each, as well as enough cups, tea/coffee facilities, TV, hairdryer, etc. (I really wanted to use the trouser-press, just for the sake of it…) Continental breakfast was included in the room price, served in a pleasant restaurant room, and the cooked breakfast option for £2 was more than reasonable. The gig I’d be playing at was a private party a few miles from Gloucester. Usually, for ‘long-distance’ gigs, we’re travelling specially, and we rarely get a chance to look around the area I’m playing in. This made a lovely and leisurely change. We nearly rejoined the M5/M4, but not being in a rush (and generally fans of weird and wonderful single-carriageway routes), we took the A38 instead. It’s only now, looking at the map properly, that I’ve realised how circuitous a route we must have taken to Chipping Sodbury, in order to even pass anywhere near to The Fleece Inn at Hillesley. Immediately intrigued by the words ‘community pub’, we headed inside, by chance catching their second anniversary celebrations of buying the pub. 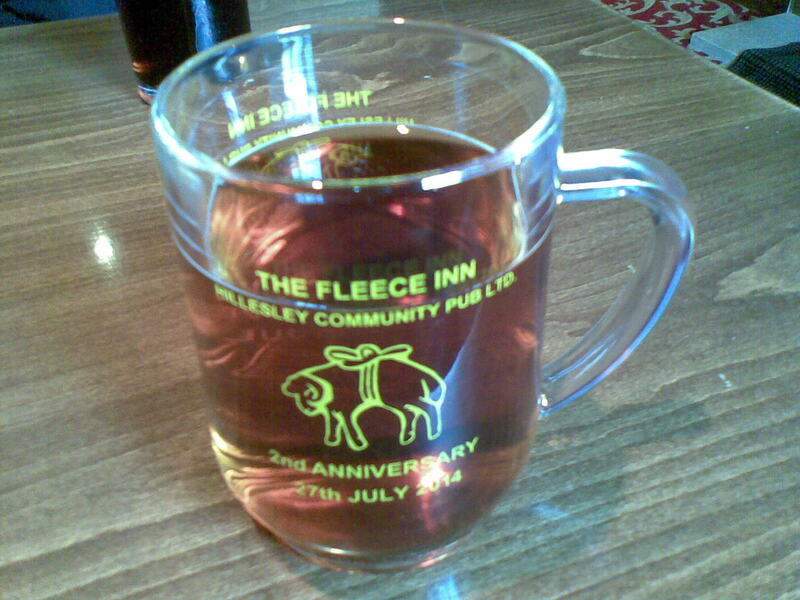 It’s always lovely to see what can be achieved if a community pulls together, and I had to have a commemorative tankard as a memento. It was filled at my request with ‘Velvet Ale’; the label asked if I could taste the peaches, and I could. We even tucked in to some chilli and pulled pork rolls for lunch, and then watched the enthusiastic line dancers accompany the live musical entertainment in the outdoor marquee. We then headed off, swinging by the gig venue to make sure we knew we could find it later, then on to Tetbury. The Chipping Court Shopping Mall brought back fond memories of the range and character of shops we used to have in the Oxford Street Arcade in Swansea years ago – unusual antiques and artwork – and it was lovely to just browse as we walked past. Emerging on the other side, we had to look at the wine cork stools next to the table outside Vinotopia. I remember thinking how convincing these giant corks looked, which must have been made of stone, so I assumed…then I looked closer and thought it was some sort of wood…and then, on tactile testing (or, in other words, like a toddler, I had to reach out and touch it), it was actually made from cork! Our intrigue was held for the crucial amount of time to be tempted in. Of course, us not being connoisseurs, the thought crossed our mind that the lowest price wines here may be beyond our price range, but we were immediately put at ease by the knowledgeable staff, who recommended a selection of reasonably-priced good wines. We bought a gift of wine for a friend and a recommended rosé for ourselves, and on mentioning we had a long distance to travel home (and a long time to wait to do so), the staff went the extra mile and donated us a polystyrene box so we could keep it as cool as possible. It is this type of ‘shopping experience’ that is forgotten when everything you need is available in the supermarket, where you zip up and down the aisles spending hardly any time contemplating, in some ways similar to the difference in the process you go through to buy a CD in an independent record store and doing the same in a supermarket, or online. In the latter case, you normally already know what you want, you just may need help to find it. In an independent store, there’s always the possibility of finding something new that you’d never thought of trying. If we’d passed the bottle of rosé that we bought in a supermarket, our thought process might have stopped at “that’s an interesting colour”, as we tried to keep in mind the loaf of bread we were actually heading towards picking up. At an independent, dedicated store, as happened in Vinotopia, this became the springboard to a dialogue, and of course a sale, but one which brought pleasure to the seller and customer, rather than an emotionless bleep before you hear the words “unexpected item in the bagging area” for the fifteenth time. Good gosh, I am old before my time! I said “good gosh” as well, didn’t I?! Golly. There were many more wonderful shops in Tetbury, as well as one of the British Toilet Association’s Toilets of the Year 2007 (there’s a British Toilet Association?! ), and we were wowed with the range of crafts in Artique, which was a Tardis-like shop, extending much further back than you would have expected from the front or the ‘front room’. Incredible large wooden murals were plentiful in the back outdoor area, and unusual crafts and textiles all around. We’d remembered seeing a sign for a farm shop on the way there, so headed back in that direction to try and find it. The Farm Shop at Hawkesbury (Upton) was behind a house, seemingly in their (large) back garden, and despite worrying that we’d interrupted the owners’ garden lunch, they were more than happy to open the shop for us. There was a plentiful selection of local cheeses, meats, jams, icecreams and breads. We had the scones with cheese for an evening snack when we got home, and they were delicious. I’d never tried cinnamon icecream before, either. Panda Appreciation: When Addiction goes bad! All views expressed on this site are personal, and do not represent Swansea University, Off The Chart Radio, or any other affiliated organisations. Unless explicitly stated otherwise, all content © Jamie Nemeth.